Seraphim Trio shines the spotlight on Beethoven’s complete piano trios in a multi-faceted project that includes formal recitals, pop-up concert experiences and educational presentations. Seraphim Trio shines the spotlight on Beethoven’s complete piano trios. As the most democratic of all composers, Beethoven’s reach extends well beyond the concert hall. Seraphim celebrates this in a multi-faceted project which brings Beethoven into the very fabric of daily life through pop-up recitals, immersive concert experiences and educational presentations. • A series of formal recitals. Presented over three or four captivating programs, this series will delve into the rhetoric and argument of classical chamber music as revealed by the most important composer of the period. • A series of pop-up recitals at the State Library of Victoria and the National Gallery of Victoria. These recitals are designed to surprise the people of Melbourne as they pass through the city, bringing the music of Beethoven into the fabric of daily life. • A series of educational concerts for school children. These recitals are designed to highlight the educational benefits of bringing classical music into daily life. We will deconstruct musical conversation found within Beethoven’s score and present it as fully formed recital work. • ‘Choose your own Beethoven’ installation is a novel concert idea conceived by Seraphim trio in which audiences will be invited to select the Beethoven trio they would like to hear in a live, spontaneous programming first! • Collaboration with street artist Peter Drew. Your donation will go primarily towards funding artist and management fees, venue hire, and, where necessary piano hire and tuning. Seraphim trio seeks to minimise overhead costs and is very proud to have strong, ongoing relationships with our sponsors and donors. 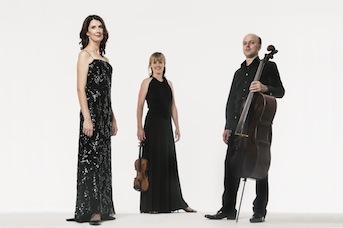 Seraphim Trio is Anna Goldsworthy (piano), Helen Ayres (violin) and Timothy Nankervis (cello). Seraphim Trio was formed 21 years ago by three friends for the pure enjoyment of making music together. The group is now recognised as Australia’s pre-eminent piano trio.